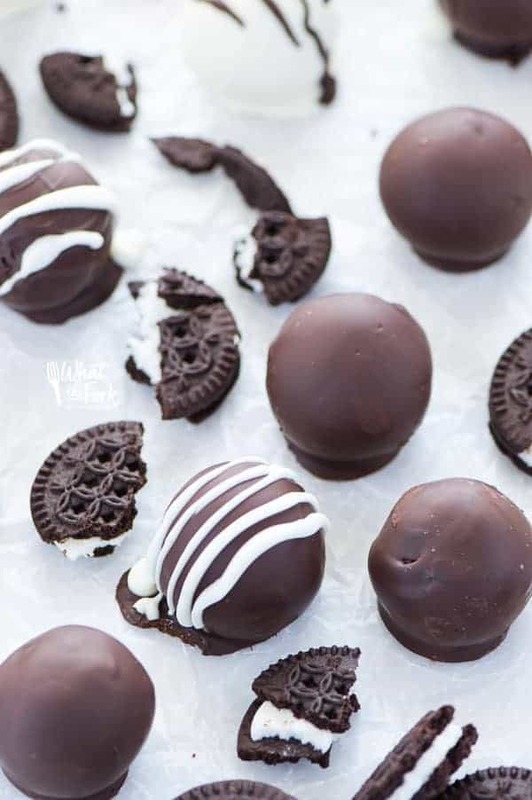 Chocolate covered gluten free Oreo truffles make an easy, no-bake dessert. These truffles have a soft creamy interior with a satisfying chocolate coating. Last year, my cousin’s girlfriend brought Oreo Truffles to a family party. But alas, they were not gluten-free so my husband couldn’t enjoy them while we all raved about them. We weren’t trying to rub it in; they’re just so darn delicious you just can’t help yourself by proclaiming it every 3 seconds. I felt really bad because he was definitely feeling like he was missing out on something good (he was). So, these Gluten Free Oreo Truffles were born. And if I didn’t tell you, you’d never know the difference. 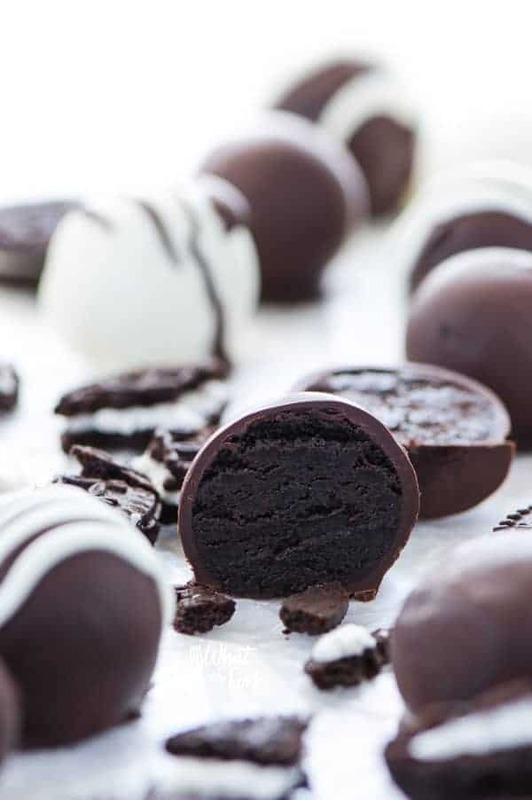 These Gluten Free Oreo Truffles have a soft, gooey and decadent chocolate interior. 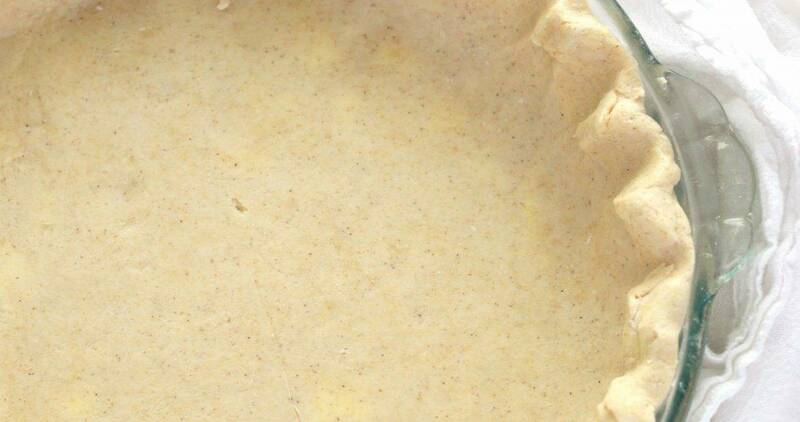 It’s creamy, smooth and everything you want a truffle to be. The chocolate coating is optional, but definitely recommended. Alternatively, you can roll the truffles in more crushed chocolate cookie crumbs. I think the chocolate coating makes them a little bit more special, especially if you’re making these for holiday gifts or to bring or serve at a party. While there aren’t actual gluten free Oreos from Nabisco, there are several other brands of gluten free chocolate sandwich cookies that are readily available. I use Glutino cookies but Wal-Mart has recently released their Great Value brand of gluten-free products, including chocolate sandwich cookies. You can use whatever brand you prefer. I make a lot of cookies and fudge every year as Christmas gifts for family and friends and every year I make chocolate covered Oreos because they are one of everyone’s favorites. 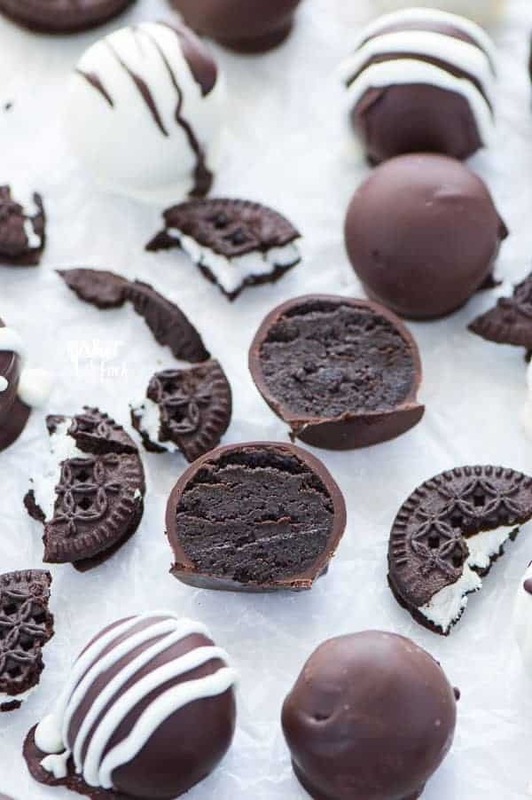 This year I’m going to switch it up and make these gluten free Oreo truffles instead. I’m pretty sure nobody will miss the old version because these are just so much better.They’re also fairly easy to make so these truffles should be right at the top of your Christmas cookie list this year! And when I say easy, I mean really easy. There’s no baking or cooking involved, which is nice because I feel like my oven is on 24/7 during the month of December. 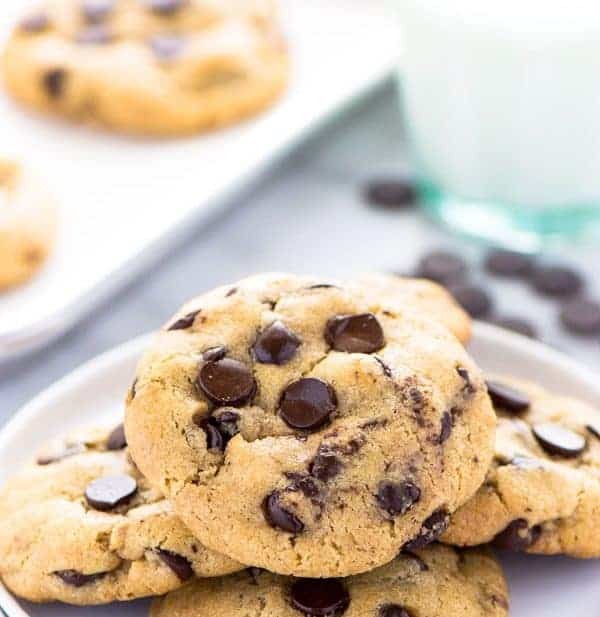 I use a food processor to crush the cookies and to mix in the cream cheese and scoop the mixture onto parchment lined baking sheets right from the food processor bowl. Dipping the truffles into the chocolate is really the only ‘work’ that goes into these. Just make sure your truffles are very cold when dipping. It’ll be much easier to coat them. And a little tip if you’re having trouble with your chocolate being too thick to dip: add a tablespoon of vegetable shortening to help give it a better/thinner consistency. Whether you make these gluten-free truffles to give as gifts or as a special dessert to accompany your holiday spread, I guarantee they will be a hit. Enjoy! This Gluten Free Truffles Recipe can also be found on Food Fanatic where I am a regular contributor. These look absolutely divine! 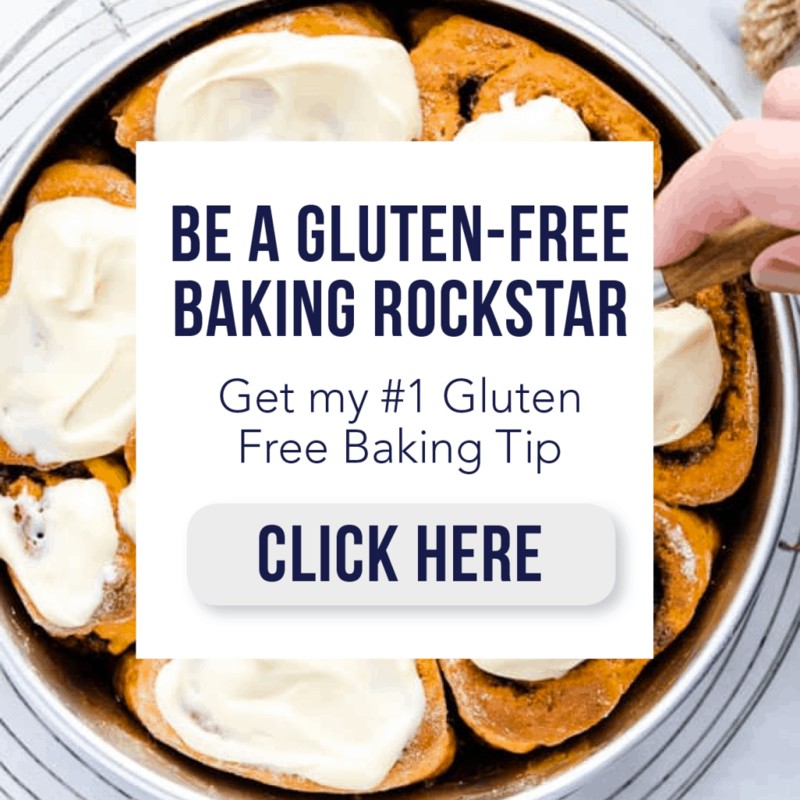 Thanks for sharing gluten free recipes! MMM – These sound a lot like your chocolate covered mint oreos that you love! Yummmmmm. These look so cute and yummy. Who wouldn’t like a whole box of these for the holidays. I love these! I have so many friends and clients that are GF who would love these! I never thought to use gluten free chocolate cookies…genius!! I can’t wait to try these and finally indulge in them! I just made candy cane oreo balls this week, but they weren’t gluten free, and I couldn’t eat them since I’m GF! I should make myself some gluten free ones, love these! These look heavenly! And the recipe sounds like something I could actually handle. Thanks so much for sharing! I can’t wait to try them! Christmas Truffles, what a special treat! Thanks so much for sharing with Full Plate Thursday this week. Hope you have a great weekend and come back soon! 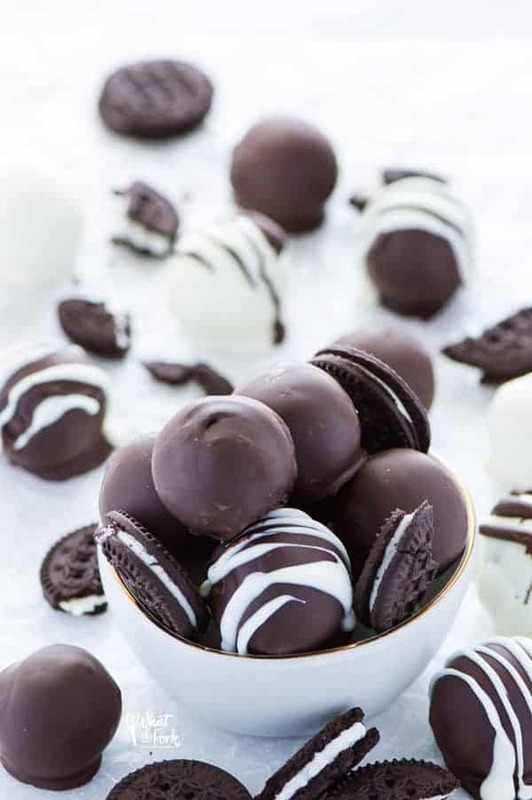 Oreo truffles are totally irresistible! Thanks for linking up with What’s Cookin’ Wednesday! Omg they really are… It’s so hard not to eat them all! These are so cute and they look delicious! My niece is gluten free and I think I’m going to make these for her for Christmas! Drool! These look amazing.. perfect for entertaining over the holidays! Especially when you have GF friends 🙂 Thank you! These look wonderful – love the sprinkles. My husband is wheat sensitive and we eat a lot of gluten free also. These oreo truffles look delicious and very festive! these look so darn good! like i would have a problem trying to stop eating them! 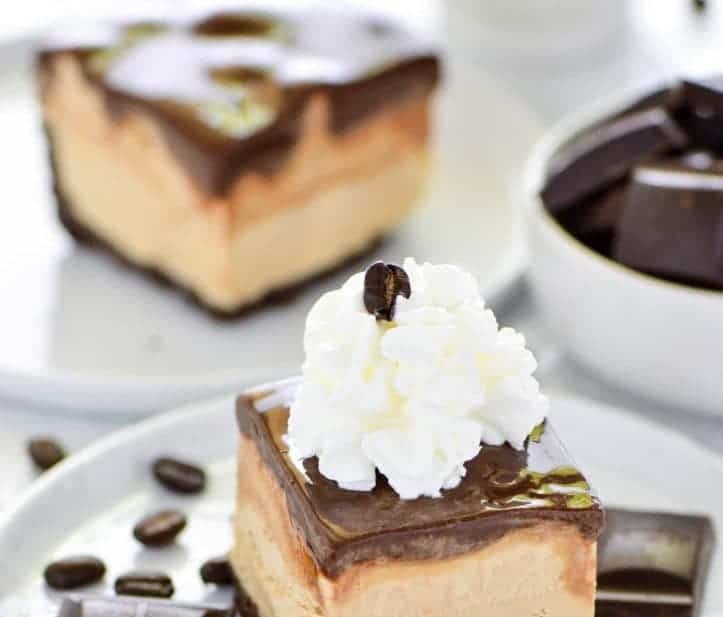 we have a couple relatives that are gluten free coming to christmas, these would be great to make for them! pinning! These look amazing! I have a gluten free sister and I am going to make these for her. Pinning. It makes about 2 dozen depending on how big/small you roll them.